Jenn and I see the employees almost every day of the year. But it's on this one special day that we see them at their happiest, together with the people that bring them the most joy-- their families. Monday September 15th was our employee appreciation/back-to-school PaRtY! According to the polls, which in this case are the looks on the employee's faces as they enjoy an evening with their children and spouses, the school party was a grand success. Jenn and the staff spent many hours preparing for the big day. First they decided on a date and a menu. Then Jenn hired someone to make 8 large, aluminum baking trays of Gratine (a cheesy baked macaroni) and one giant bowl of pikliz. We called in another cook from the village to make rice, plaintains, and fried chicken. Dadou made a budget and Erode went to town to do the shopping. They delegated certain cleaning tasks and hired a few women from the village to make decorations. We knew that if our party loving Dads had anything to do with it, and they did, then the education building and the property were going to look nothing short of magnificent come evening. The plan was to cook some of the food at our apartment and then pick it up and bring it back to the land at the end of the work day. Baked macaroni is a special party dish, made even more special by the fact that our own Second Mile cooks didn’t have to labor over it. But, when Jenn arrived home to help the 3 women who were already cooking there, she discovered that we were fresh out of propane and short on time. Luckily, there were a few accommodating neighbors floating around our “apartment complex” and we were afforded the opportunity to finish the meal in two different apartments with a combination of 2 stoves, 4 burners, and a patio grill. Despite that small set-back the food was delicious and there was plenty for everyone. But clearly the food is not the main event. The party was for our employees, 2/3 of them parents, to celebrate the fact that their children are growing, learning, and going to school this year thanks to the generous donations of many of you, but also thanks to their commitment to this organization and the tremendous effort they put forth so that their children have opportunities to flourish. The party was also for the students. Last year was our first full operational year. We spoke with the staff and they agreed to take their employee bonuses in September as it would make tuition and school costs so much more manageable. Much like this year, we also gave some additional scholarships to make sure that no child was left behind. Because of the additional support each of the employees were able to enroll all of their school-aged children in school. At the beginning of this year we learned that every single child had advanced to the next grade. Dadou’s daughter was even accelerated from pre-K to first grade! If you didn’t read the blog post that explained why that is SUCH A BIG DEAL, you might not quite understand the rationale behind our yearly push to raise funds for education. Go back and read it, if you'd like. The party was also for you. For those of you who donated towards our employee bonuses (a 13th paycheck for every employee) and student sponsorships (additional funds for school fees) Thank You! 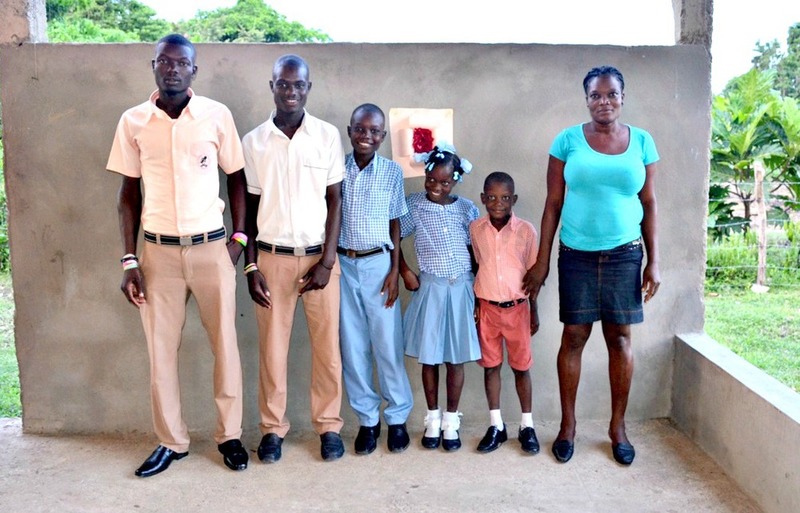 Again this year, after receiving their bonuses every employee returned with receipts to show Dadou and Jenn that they’d chosen to spend their bonus money on school fees, uniforms, and/or books. This qualified everyone with kids to receive additional scholarship money. In the end $150 was spent towards each child’s education. Raising $150 x 51 was no small goal but you gave generously and the school fees were funded in a matter of weeks. In Haiti less than 50% of children are able to complete primary school as Haiti does not have a free-to-all public school system. We can confidently say that there are 51 children who are on a path to complete not just primary school but secondary school as well and perhaps even university! They will undoubtedly go on to do great things. And that's something to celebrate. The employees started the event with a passionate time of prayer, worship, and thanksgiving! Over and over I heard one employee or another thank God for this “grand occasion!” I couldn’t help but notice the contrast. Every year around August I start to see articles and posts on Social Media. Parents are Hallelujah-thankful that summer is coming to an end when they will be able to work more, sleep more, entertain [their children] less, and get their houses back in order. Parents are looking forward to less headaches related to fighting children and complaints of boredom and praising Jesus at the site of the big yellow school bus and the notion of free supervised child-care also known as early education. No one ever seems to mention being thankful that their children get to go to school. I guess it's just a given. These moms and Dads on the other hand were thanking God for what is truly a privilege in Haiti: healthy children, able to attend school. Then the kids (and the adults) got tired and the sun went down and the party was over. We were reminded that the gift of education is not something to take for granted. Once again, a big thank you to everyone that donated towards school sponsorship! You can always pray for these students and their teachers this year and keep your eyes open for next year's school post. Now that we've been living in Haiti for 4+ years it's safe to say that we're total experts, right? Still, there are a few "cultural nuggets" we've gleaned through time spent with this beloved country and her people. One of my earliest lessons came after 6 months of living in Haiti--September, 2010. Then I was the nurse at an infant care center. How's this for a throwback? By that 6-month mark I had started to build relationships with many of the nannies. These were all women about my age and older who had been hired to take care of the children at the center. There were anywhere from 15 -25 women on staff each day. They worked 24-hour shifts and since I lived at the center and was on-call 24/7...well...we got to know each other pretty well. By this time I knew all of their names and was starting to learn more about their lives, like whether or not they were married and how many children they had. September hit and suddenly the nannies had all kinds of ailments. I was used to the occassional complaints, PMS and the like but this was different. High blood pressure, headaches, colds, body aches, fatigue. It was uncanny. Why the sudden onslaught of symptoms in this group of generally healthy women? I was at a loss until one woman was nice enough to spell it out for me. M panse twop, she said. Which means, I've been thinking too much. What's bothering you? I ask. > Oh, it's just that time of year. And what time of year is that, exactly? > Sezon lekol. School season???? That was her answer!? That was her explanation for this staff-wide immune system breakdown?! That's when I got the whole scoop and it made sense. I learned that school would be reopening the first week in October. Registration fees were due along with the first of three tuition installments. Books had to be purchased and we're not talking just a few workbooks and readers. These lists had 10, 12, even 15 different titles per grade. And each child needed a backpack. In some cases backpacks could be shared between students, such as if a family had more than one child in the same grade. It happens more often than you would expect since one-on-one classroom instruction is limited or so I learned. I later learned that moms and dads who have not had any formal education themselves, cannot afford tutors for their children when they fall behind. I learned that there are few things more defeating for a parent living in poverty than having to pay the school fees for a single grade more than one year in a row. There were also uniforms to be made. And you had to hurry if you wanted to get a good deal on fabric and tailoring. Prices would skyrocket as the summer days dwindled. In 2010 the official start date of the new school year would be announced by the president via national radio. It was a complicated year to say the least. Still, a parent concerned about making ends meet knew the general date, give or take a month, and as the countdown towards the first day of school drew nearer financial anxieties increased five-fold. It was palpable. The nannies were mothers. They had to factor in these extra costs that, although somewhat expected (since school season happens every year), aren't a part of meeting their families day-to-day needs for food and shelter. The monthly salaries they earn had long been spent on food and family emergencies. Now their thoughts were consumed with how to make hundreds of dollars appear out of nowhere-- and it was keeping them up at night. School season was stressful, and it was making these women sick. It was a rude awakening for me. The whole school thing. 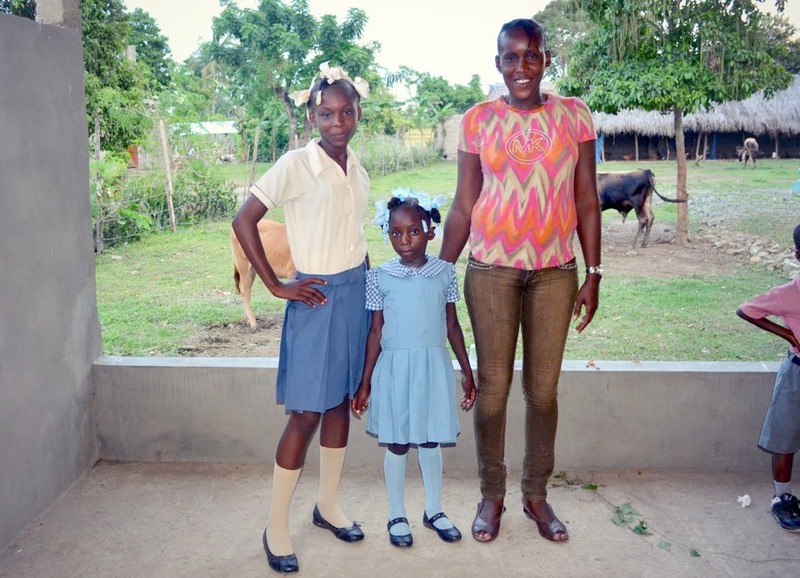 Getting to see what women went through in order to get their children in to school and what they continued to go through day after day to keep them there gave me my first guttural glimpse into motherhood in Haiti. There's something other than just the "joy" of motherhood. What is it? Ah yes, hardship. Jenn had a similar experience. She learned about the school system that same year when she took on a roll to help run a school sponsorship program. In following up with the children currently enrolled in sponsorship, Jenn learned about the myriad ways a child could fail a grade thus having to repeat the class again the following year. The child could be hungry. Without food the child's mental alertness would be lacking, leading to poor scores. He or she could arrive at school with a dirty uniform one too many times. Cleanliness and overall presentation if highly valued in Haiti and children who do not meet the dress code requirements are sent home. For families living in extreme poverty the cost of soap for a daily wash might be too much. The child could be sick. The child could miss too many days of school or worse, he or she could be sick on one critical day. Exam day. To not be present on exam day disqualifies you from passing the grade in many schools. End of story. Jenn remembers making multiple visits to the home of a struggling family who had multiple children sick with malaria in the final weeks of school. That one illness almost cost 3 children an entire year of school. You probably get the point. If the parents with jobs can't afford tuition and the parents whose children are going to school for free can't afford the right nutrition and medical care needed to keep them there--than how in the world can children complete 15 years pre-collegiate education in Haiti. It certainly isn't simple. Public schools are few and far between. Free-school lunch is not a mandate. Still, putting one's children through school is one of the most dignified acts of parenthood and something every parent in Haiti wants for there child. (Alright, now it's Jenn's turn to write). Ok It's me, Jenn now. You may have seen some of the statuses I posted on Facebook this week. We've been talking about school sponsorship and sharing some photos of our employees kids; the children are dressed in their school uniforms and sitting next to their proud parents. All these photos were taken last year at a “back to school breakfast” we held right after our employees got their bonuses and promptly enrolled all their children in school. The photos were taken by the lovely and talented Elektra Carras. Last year, I was suddenly an employer and as an organization we had a chance to make this time a little bit easier on our staff. 17 of our 20 employees have school aged children- and combined these 17 people have 51 children! Last year, in order to increase the likelihood that our beloved employees would be able to manage all of the costs associated with putting anywhere from 3 - 8 children into school, we gave them their annual bonus (equivalent to a month’s salary) in September instead of December. Everyone agreed to this plan, wholeheartedly, but our Director wanted to see if the funds were in fact used for school so he asked to see receipts. And as was expected everyone returned with receipts from various schools. Kids had been enrolled. Tuition and uniforms fees paid etc. Over this past year I was able to assess how the first year of giving away school bonuses played out. Not only did the employees remain healthy and in good spirits during “school season,” but throughout the year hardly anyone was sick or asked for a day off work. I have actually have to force these employees to take vacation! Very rarely did anyone ask to take a pay advance and never did anyone need to borrow money for anything school-related. That makes my job a lot easier! Last year, not a single one of these students dropped out of school mid-way through the year. And, big news people, there wasn't a single child that didn't graduate and move on to the next grade level!!!! These children have moms and dads who because of their employment can focus on putting food on the table every night and can make sure to purchase meds when needed or take the children to the hospital and pay for medical bills. No child missed school because of a "payment that has not been made to the school” or the lack of funds to purchase books or uniforms. These kids have moms and/or dads that have all the means to make sure these kids don't miss school and that they are succeeding—learning to read and write even if they themselves never had that chance. This is why we are passionate. We can't wait for the day when all 51 kids of these kids have completed university. We can't until the day when there are doctors, nurses, vets, investors, engineers, and store owners coming from this AREA! These kids are the future of Haiti and they are being raised up by some amazing parents. As you may be aware it’s much easier to raise funds at the end of the year rather than right now. Shelling out double the payroll plus some isn’t easy to do at this particular month. But God Bless You people! We are so thankful that you value this push for education as much as we do. This year, because of your GENEROUS donations, it looks like we are on target to be able to give a secondary school stipend to many of our employees, especially those that have children in high school, and the employees that large families. 5 of Joslin's 8 children! Jiji with her two children! Second Mile is located 15 miles outside the city. We are in the “country” surrounded by 5 different villages. In the nearest village there are 3 schools. Two of the schools are primary and the other is a secondary school that goes all the way up to 9th grade. If you want to attend "high school" you have to travel outside of the village and make your way to the city. This is costly for people who live in this area. There isn’t direct access to public transportation which means motos must be hired to take the kids to and from town each day. That expense can be huge-at least $2/day! Not many are able to afford to pay tuition and be able to account for daily transportation to attend school. It's a rare thing for children who live in the village to stay in school through high school. We are hoping that it becomes less rare as the tide in Haiti is certainly changing for the better. We currently have 16 employee's children who are attending school outside the village-- hence the reason why it's important that parents don't have to go into debt before school even starts. In case this post hasn't been encouraging enough. Here is one more bit of encouragement. I always like to talk to Ama about school. His nickname in Creole is “the professor.” He is our oldest employee. And did you know he was actually mayor of all the surrounding villages at one time? We enjoy what he brings to the table as a member of our staff. Yesterday Ama told me with pride that this year will be one of his daughter's last year of school. He said that next year she will be heading to University (the first of his 11 children) and that she wants to be a doctor. I said, “wow, so out of all the employee's kids you have very first one that will attend University!” And he just smiled REALLY big. During this talk Ama and I also made a deal that he would be in charge of making sure that none of the staff kids fall behind. If any of the staff children need tutoring this year Ama has volunteered his services because he knows how important it is that a child stay in school. Ama teaches daily literacy classes to our moms and a twice weekly literacy class to adults in the village. So that's what we have to say about school. If you'd like to contribute. Wonderful! We are still fundraising for this need. We're budgeting $150 per employee child to make sure that all back-to-school needs are met. We have 29 sponsorships of $150 accounted for already. Only 22 more to go! We will be gathering with all the parents and kids again this year. This time for a back-to-school dinner. If last year was any indication of what's to come, we are expecting great things for this generation of Haitian students! Thank you on behalf of all of us! Things Just got a little more "legit"
We had a team last week! That's quite rare around here but we really enjoyed this team and we are so thankful all the hard work they put into making the facility more usable. They worked marvelously with the Second Mile employees in a way that gave them ownership of some of the projects (see the deck project below). The project wish list we set before the team could have seemed terribly daunting, but they completed the tasks with ease and efficiency. Serious, efficiency. Most mind blowing was the way they tackled the chair project. We borrowed a model chair (desk) from another organization and wanted 20 chairs built to suite. So, in the most sensical of ways they started cutting wood. They sliced and diced 1 x 4s until they had 20 sets of the various chair components. The pieces were varnished and assembled. I think it's fair to assume that the Ferguson's and Jason enjoyed getting to know Loudjina's dad, Jimmy. He worked at the site for two weeks to earn the money the family would need to go to Port au Prince to meet with a team of neurosurgeons. 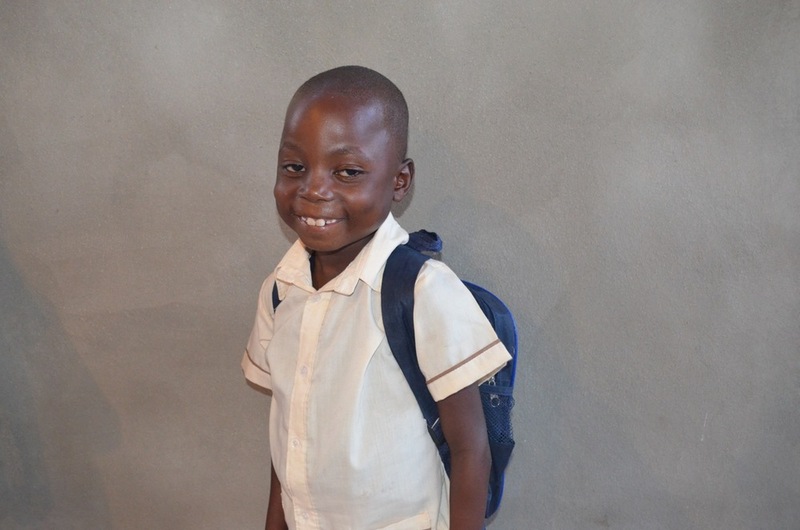 Jimmy and his mother-in-law left for Loudjina's surgery consult the same day that our team left to head back to the States. I'm sure many of you are wondering what happened. Based on the January assessment of Loudjina's condition the surgeons had ruled out the possibility of placing a shunt, yet there was still talk of an alternative surgery. Sadly, when the family showed up to the hospital on Friday the surgeons deemed that her pressure sores posed too great a risk that the surgical site would become rapidly infected. We had suspected that... There's always the tendency to gear ourselves up for the bad news, even when at our core we hope for a miracle. At this point, we are at peace. We were able to help the family make three trips to Port where they met with US based neurosurgeons. At least they had a chance. Between those trips they spent a combined total of 10 weeks at our site during which we loved them and stood beside them through some of the scariest, happiest, and most painful of moments. Deep down I struggle with how unfair it is for Loudjina to have lived her life like this. Such a cumbersome existence. And her parents... and grandparents, aunts and uncles and the friends that have loved her... it's not fair for them that she won't live as long as she should. It shouldn't be like this.. but it is. Acceptance brings peace. And I find comfort in my belief that God, who is love, loves Loudjina in-quantifiably more than myself or Jenn, or her parents, or the surgeons that devote their lives to kids like Loudjina, ever could. That's the silver lining. The other silver lining is that Loudjina has a ridiculously cool wheelchair. On the Wednesday before they left for Port-au-Prince, our friends at Haiti Hospital Appeal called. They wanted to make sure Loudjina didn't miss out on this amazing opportunity. We quickly loaded up the family in the truck and Jenn took them over to the hospital where Loudjina was fitted with a custom wheelchair, courtesy of Canada Healing Hands. 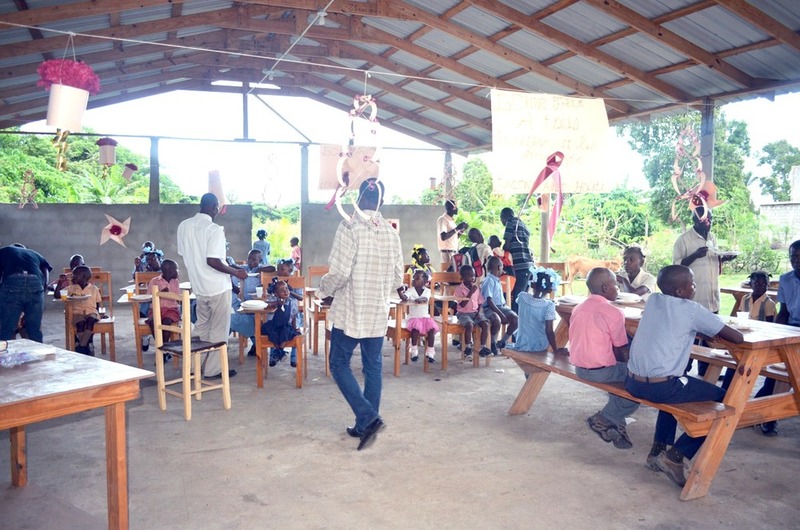 This group worked tirelessly to create the perfect chair for what must have amounted to hundreds of kids in and around Cap Haitien. What a special moment it was for Loudjina and family, and all of the children who were able to benefit. The next day Loudjina took a spin in her new chair. Can you imagine? Meanwhile, the team continued working. By this time they were finishing up the tiling project. The two rooms adjacent to the education center have been unused to date but will soon become an office and a sewing room. The tile will help keep the rooms clean and bright. With a little coaching, Joslin and Verdieu were able to tile one of the two rooms on their own. Joslin and Verdieu got an "intro to tiling" during Jason's last trip. Last January, Jason and the guys tiled the space we've cleverly dubbed "the upstairs apartment." It's a second story building where some of our employees sleep. It also has a bathroom, a kitchen, and an area that doubles as Jenn's office. It's also where we make enriched milk. And it's been home to many a spontaneous staff meeting. Thanks to the team, this space has a lovely new chalkboard, made possible by plywood and chalkboard paint. After the tiling and the chairs, the team built four picnic tables and four table/desks. They also made several more chalkboards. Now the education building is ready for action! Well, I suppose we still have some cleaning to do. We will have to move some of these picnic benches out under the mango tree. Then we will line up the desks to give that traditional classroom feel. Why are we so excited about chairs and tables?! Well, the education building has given us an opportunity to host community events, although without any benches, we always had to hall out the beds to use for seating. Also, the moms come to the education center for their business classes and some of their health classes and it is used by staff when they want to meet for prayer and worship. The garden employees have always taken their lunch here. Now they will have a wider range of seating choices and an actual place to rest! They will still come into this space for special training seminars, only now they won't have to sprawl out to take notes! Ama, is arguably the most excited about these improvements. He gets to teach a literacy class to the moms! As a former school professor, his heart for teaching is one of our favorite things about him. He values education and he loves to learn. When we spoke with him about the possibility of teaching some basic reading and writing skills he jumped on it. Jenn broached the subject with him and that very same day, after a long 8-hours in the gardens he went home, changed into some "teacher clothes" and headed over to officially enroll the moms in his class. It was very, very official. He made two lists, one with the names of women who could read and write and the other with those who can't. Then he submitted a written request to Jenn. Notebooks, please. The last and final project, was a deck that was built with the intention to get some of the cooking up off the ground. It's just the beginning but we are very pleased to see how easily the deck came together. We plan to add a palm-branch canopy (similar to the one on our chicken coop) which will ensure that every one eats even during the rare, mid-afternoon rain storm. Between the desk-chairs, and the wheelchairs, I'd say we had a great week. Thanks again team!